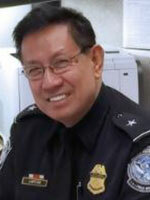 Dr. Romelito Lapitan currently serves as the Director of Ag/Bio-Terror Countermeasures division within the Agriculture Programs and Trade Liaison, Office of Field Operations, based at the US Customs and Border Protection (CBP) headquarter in Washington, D.C. In this capacity, he develops and manages programs that support national biosecurity and safeguard American agriculture while facilitating entry of USDA-compliant trade and travel. He came to Washington, D.C. in November, 2011 after serving as a Supervisory Agriculture Specialist at the Otay Mesa Commercial port of entry in San Diego, California. Prior to joining CBP in February, 2008 as an Agriculture Specialist, Dr. Lapitan was a Research Scientist with the Natural Resource Ecology Laboratory at Colorado State University. His scientific studies focused on quantifying transport of atmospheric greenhouse gases and movement of groundwater contaminants through variably-saturated soil media. Dr. Lapitan received his Bachelor of Science and Master of Science degrees in Agriculture from the University of the Philippines at Los Baños, Philippines and Doctor of Philosophy in Agronomy from Kansas State University. Discussion of what veterinarians and clients need to know in order to successfully import animals into the United States.